If the pedal height is incorrect, adjust it. (a) Remove the scuff plate, cowl side trim, lower No. 1 panel, LH lower panel and No. 2 heater to register duct ( BO-81 ). (b) Remove the steering wheel pad, steering wheel lower No. 2 and No. 3 covers, steering wheel, combination switch, column upper and lower covers, steering column assembly and thrust stopper ( SR-14 or SR-29 ). (c) Disconnect the connector from the stop light switch. (d) Loosen the stop light switch lock nut and remove the stop light switch. (e) Loosen the push rod lock nut. (f) Adjust the pedal height by turning the pedal push rod. (g) Tighten the push rod lock nut. (h) Install the stop light switch. (i) Connect the connector to the stop light switch. (j) Push in the brake pedal 5 - 15 mm (0.20 - 0.59 in. ), turn the stop light switch to lock the nut in the position where the stop light goes off. 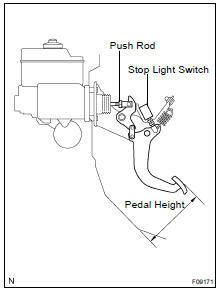 (k) After installation, push in the brake pedal 5 - 15 mm (0.20 - 0.59 in. ), check that stop light lights up. (l) After adjusting the pedal height, check the pedal freeplay. (m) Install the thrust stopper, steering column assembly, column upper and lower covers, combination switch, steering wheel, steering wheel lower No. 2 and No. 3 covers, and steering wheel pad ( SR-14 or SR-29 ). (n) Install the No. 2 heater to register duct, LH lower panel, lower No. 1 panel, cowl side trim and scuff plate ( BO-81 ). (a) Stop the engine and depress the brake pedal more than 40 times until there is no more pressure left in the booster. (b) Push in the pedal by hand until the second point of resistance begins to be felt, then measure the distance, as shown. If incorrect, check the stop light switch clearance. If the clearance is OK, then troubleshoot the brake system. HINT: The freeplay to the 1st point of resistance is due to the play between the clevis, pedal link and pin. It is 1.0 - 6.0 mm (0.039 - 0.236 in.) on the pedal. (a) Remove the floor carpet. (b) Release the parking brake. With the engine running, depress the pedal and measure the pedal reserve distance, as shown. If the reserve distance is incorrect, troubleshoot the brake system.